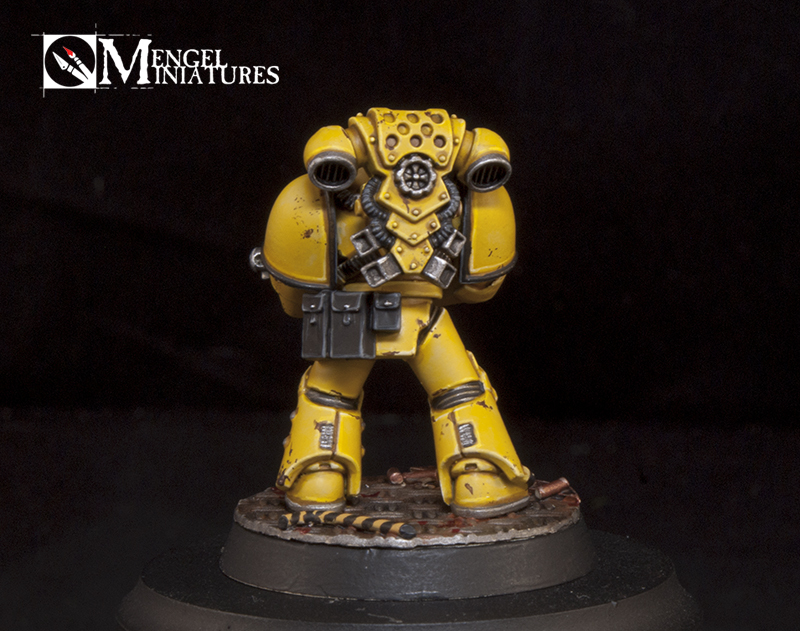 As soon as I got the Betrayal at Calth boxset I started thinking about what legion I would paint it as. I went through several options, World Eaters, Word Bearers, Ultramarines, even adding the models into my Astral Claws. In the end though I decided to do the 7th legion, the Imperial Fists. I had always wanted to do an Imperial Fists army, the bright yellow always called to me. It was too intimidating in the past and very time consuming. 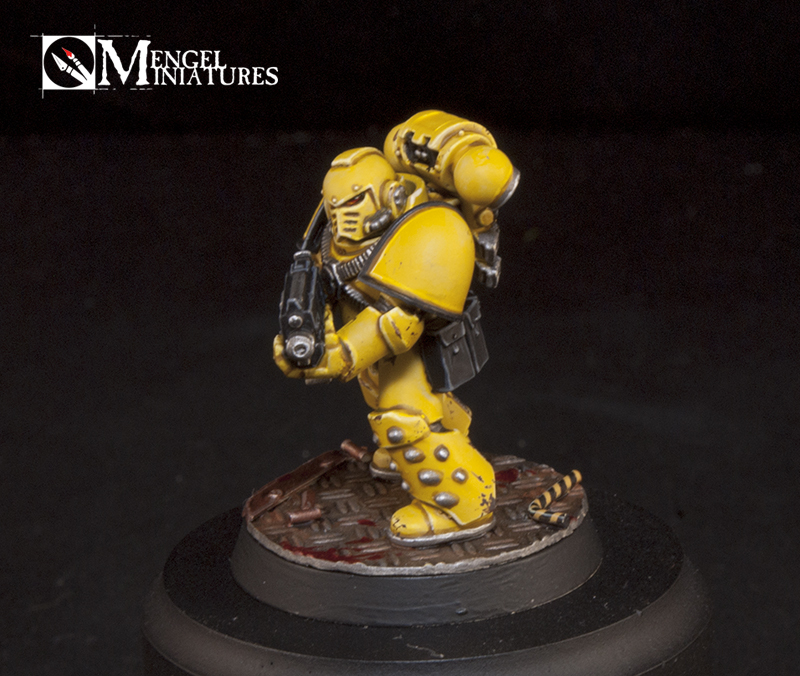 I had actually painted a test model of a Heresy era Fist long before the Horus Heresy had even gotten its own book series. A friend had traded me some of the Rogue Trader era beaky marines, I still have the one somewhere. This was long before any of the new paints, even before GW had washes or shades, only inks. His base had been made to reflect the siege of Terra. Back then that just meant that I painted it grey. When it came to starting this army I wanted it to occupy a point in time. The Heresy to me is all about theming your army around specific forces or battles. Space battles have always called to me for some reason so the battle of Phall was an obvious choice. It doesn't hurt that I also really like the Crimson Fists and Alexis Polux, the future Chapter Master of that Chapter, happens to be the leader of that contingent. My hope is that this also gives me a chance to feature my army in several key battles. I know they are at Phall, and now it looks like they will also be at Sotha and what ever other battles there are in the Imperium Secondus. Hopefully Polux's marines also return to Terra at the end too, allowing me to be a part of the most important battle in the whole Heresy. I have also done pretty standard bases on all of my armies. Some form of sand, rocks and grass. This project gave me the opportunity to try out something a little more complex. I had made a spaceship base for the Badab War duel I had painted for the Golden Demons a few years ago and still had all of the supplies from that. Breaking them out I gave it my best shot and I had a lot of fun doing it. It definitely takes more time then gluing sand to the base, but I really like how they look. It's a ton of fun to paint too, and really evokes the feel of the battle of Phall. I have one of the event only Heresy marines from last year, the one stepping on a backpack, and I'm already looking forward to painting the backpack as an Iron Warrior's. At the moment I am working on my first Terminator from the set, and after that I think I'm going to tackle the Contemptor. 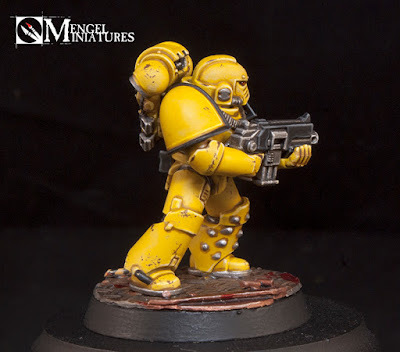 Only 29 more marines, 4 Cataphracti and the characters after that. 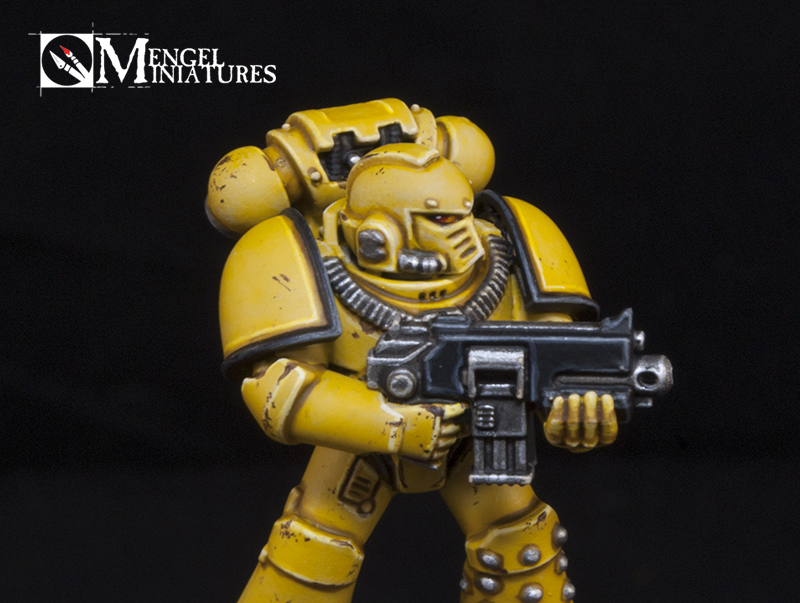 I am trying to paint these in my own version of "speed painting" so I can get the force on the table. I don't really know how to expand it going forward. I feel like I need tanks, but I don't feel like that really fits the boarding force theme, plus painting tanks has to be one of my least favorite models to paint. I am waiting on getting the Forge World transfer sheet at some point before I add any Legion symbols to them. 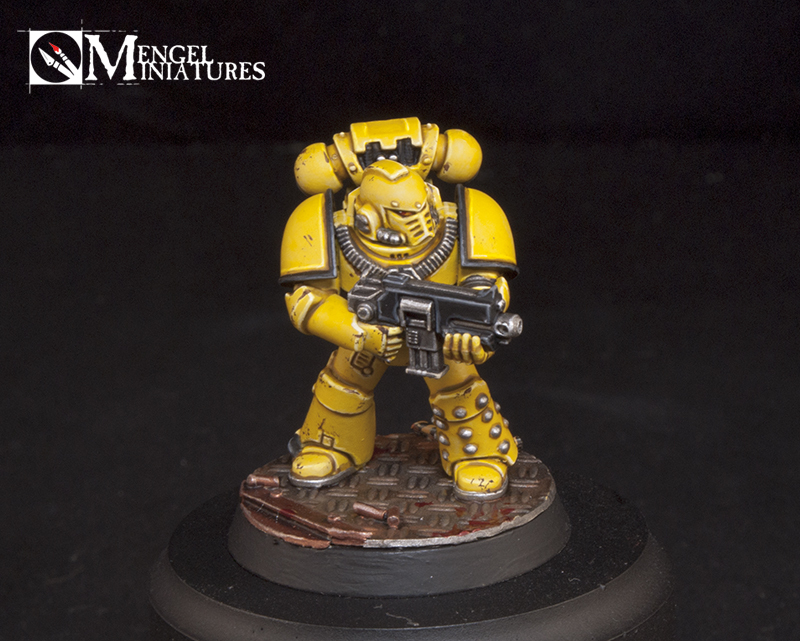 Freehand painting a bunch of Imperial Fist symbols would take me a little longer then I want for this force. You may have noticed that I didn't really go over how this was painted. Worry not, that's because on Wednesday I will have an extremely in depth step by step guide with pictures of each stage. 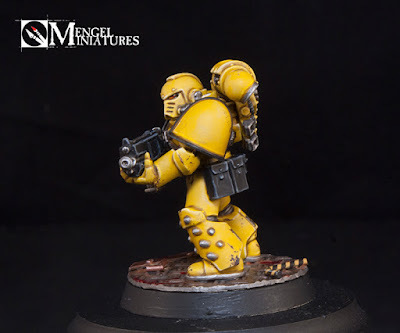 For now, here is a 360 degree video of my first Imperial Fist.